Over 100 international civil society, private sector and government representatives gathered at the 7th ASEF Public Forum: Enabling Crossovers held on 18 October 2014 in Amsterdam, the Netherlands for discussions on the importance of creative industries for sustainable growth and development in Asia and Europe. The Public Forum was organised by the Asia-Europe Foundation (ASEF) in partnership with Ministry of Education, Culture and Science, the Netherlands and Het Nieuwe Instituut, the Netherlands and with the support of the European Cultural Foundation (ECF). 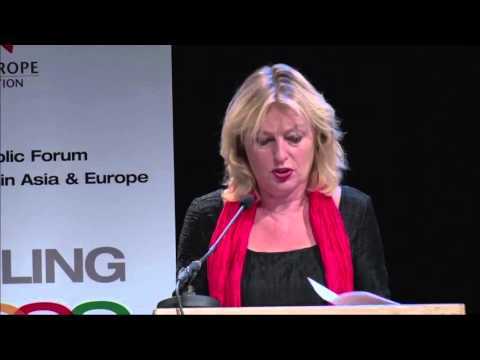 The Forum was formally opened by HE Jet BUSSEMAKER, Minister for Education, Culture and Science, the Netherlands. It was organised in the framework of the 6th Asia-Europe Culture Ministers’ Meeting (19-21 October 2014, Rotterdam, the Netherlands). The Forum also marked the opening of the ASEM Culture Network Programme, a gathering of 40 cultural professionals from Asia and Europe for four days of workshops and site visits across the Netherlands, organised by Het Nieuwe Instituut. The key messages that emerged from the Forum highlighted the role of creative industries in enabling crossovers between arts, business, science and education, the impact of the resultant innovation on helping achieve sustainable growth, and the scope for international collaboration and co-creation between Asia and Europe. These messages were presented at the 6th Asia-Europe Culture Ministers’ Meeting and the ministers expressed their appreciation and positively received the ideas and messages. They also acknowledged the ASEF-commissioned publication, Enabling Crossovers: Good Practices in the Creative Industries as a useful input to the ministerial meeting. ASEF's role in supporting knowledge exchange between Asia and Europe and fostering bi-regional co-operation was also acknowledged in the Chair's Statement of the ministerial meeting. In particular, the Ministers valued positively the function of ASEF in translating key recommendations of the 6th Culture Ministers' Meeting into concrete activities such as the Experts Meeting and Public Forum series. The programme and reports of the Forum are available in the Documents section of this webpage. The concept note of the ASEM Culture Network Programme and brief profiles of the 40 participating professionals are also available in this section. The 7th ASEF Public Forum is part of a long-running dialogue series on policy issues of mutual interest and common relevance for Asia and Europe. Past Experts' Meetings and Public Forums have taken place in Hanoi, Viet Nam (2013), Yangon, Myanmar (2013), Yogyakarta, Indonesia (2012), Melbourne, Australia (2011), Seoul, Korea (2011) and Amsterdam, Netherlands (2010). The next meeting in this series, Cities: Living Labs for Culture? - 8th ASEF Public Forum on Creative Cities in Asia and Europe (24 November 2015, Gwangju, Korea) will provide inputs to the discussions at the upcoming 7th Asia-Europe Culture Ministers’ Meeting. On 20 January 2016, HE Ms Jet BUSSEMAKER, Minister of Education, Culture and Science, the Netherlands wrote the article titled The Economic and Social Significance of Creativity, to celebrate the 20th Anniversary of the Asia-Europe Meeting. In her article, she reinforced her message that “one of the reasons why the market is looking at the creative industries [is] to provide creative solutions for societal problems”. This article is part of the ASEM 20th Anniversary Publication on “Celebrating 20 Years of Asia-Europe Relations”. The publication is a collection of articles by leaders from Asia and Europe on the past, present and future of ASEM. The book will be launched at the 11th Asia-Europe Meeting Summit (ASEM11) in 2016 in Mongolia. ASEF’s significant role in reinforcing the Asia-Europe Meeting (ASEM) process was re-emphasised at the 6th ASEM Culture Ministers’ Meeting, on 19-21 October in Rotterdam, Netherlands. The Ministers commended ASEF’s efforts in facilitating bi-regional co-operation in arts and culture among the 51 ASEM members, and, in particular, its role in supporting the 6th ASEM Culture Ministers’ Meeting, which focused on the creative industries. Referring to the rapidly-growing creative industries sector, ASEF Executive Director, Ambassador ZHANG Yan, presented recommendations from cultural experts and creative professionals to the Ministers of Culture gathered in Rotterdam. One of the key points of the recommendations focused on the role of governments in supporting the creative industries through policy, specifically on the key areas of creative cities, skills and entrepreneurship. During the Meeting, the Ministers also highlighted ASEF’s contribution in developing and managing the online platform culture360.asef.org, which promotes the exchange of information on arts and culture in the ASEM region. ASEF’s long-standing support to the Asia-Europe Museum Network (ASEMUS), which currently includes over 100 member museums from 38 countries, was also acknowledged. In conjunction with the Ministerial Meeting, ASEF also organised the 7th ASEF Public Forum on Creative Industries in Asia and Europe: Enabling Crossovers on 18 October 2014 in Amsterdam. The forum focused on the rapidly-growing creative industries sector of Asian and European economies as a key means of addressing social and economic challenges. It was attended by over 150 representatives from cultural organisations and government delegations of Asia and Europe. Charles LANDRY (UK)isan international authority on the use of imagination and creativity in urban change. He invented the concept of the Creative City in the late 1980s. This became a global movement and changed the way cities thought about their capabilities and resources. Charles facilitates complex urban change and visioning processes and undertakes tailored research often creating his own projects. These include the ‘creative city index’ in collaboration with Bilbao, the concept of ‘civic urbanity’ and the ‘creative bureaucracy’ jointly with the South Australian government. In 1978 he founded Comedia, a highly respected globally oriented consultancy working in creativity, culture and urban change. He has completed several assignments for a variety of public and private clients and given key note addresses and workshops in over 55 countries across the continents. Mary-Ann SCHREURS (Netherlands) is the Deputy Mayor of Eindhoven. Her portfolio includes culture, design, innovation, real estate and land development, public space (water, green spaces, light, including maintenance), cultural heritage, monuments and archaeology. She has co-initiated European innovation projects linked to design. Anmol VELLANI (India) is the Founder and former Executive Director of the India Foundation for the Arts, an independent philanthropic organisation supporting the arts in India. In an advisory capacity, he has served as the Co-Chair of Conference of Asian Foundations and Organisations; on the Advisory Council of the Asia Society India Centre; and on the India Advisory Committee of The Resource Alliance, among others. He has written on a range of subjects – including the arts and religion, corporate patronage, arts entrepreneurship, the role of foundations, intercultural dialogue, and arts philanthropy and the law. He has helped to design courses on the arts and management, served as faculty for training workshops in grant making, and used theatre methods to conduct creativity workshops. He has directed several theatre productions in different languages and locations, both in India and abroad, over the last 35 years. He studied philosophy at the Universities of Pune, Oxford and Cambridge, and taught at Elphinstone College, Mumbai, in the 1970s. Ada WONG (China) is the Founder and Hon. Chief Executive of the Hong Kong Institute of Contemporary Culture and the Supervisor of HKICC Lee Shau Kee School of Creativity. A staunch advocate of creative education and cultural development, she founded the non-profit Hong Kong Institute of Contemporary Culture over 13 years ago. In the last two years, HKICC further launched two signature events – the Make a Difference (MaD) Platform (www.mad.asia) and the Chinese Creative Industries Forum (CCIF) (www.ccif.hk). She was an elected Urban Councillor, District Councillor and Chairperson of Wan Chai District Council. She received her BA from Pomona College, California, USA and MEd from the University of Hong Kong. She is also an Honorary Fellow of Lingnan University and Hong Kong Institute of Education. Tamara ABED (Bangladesh) is part of the senior management team at BRAC. She heads two of the most profitable of BRAC’s social enterprises including Aarong; the largest retail chain of lifestyle store in Bangladesh, selling handicrafts made by its 65,000 rural artisans. She also heads BRAC Dairy, the second largest dairy operation in Bangladesh, which provides rural farmers with a value chain linkage to the market and protects them from price volatility. Tamara is also on the board of BRAC Bank, a publicly listed commercial bank with the largest SME portfolio in Bangladesh. She received her MBA in Finance from Columbia University and B.Sc. (Econ.) from the London School of Economics. Amareswar GALLA (Denmark) is founding Executive Director, International Institute for the Inclusive Museum. He is an alumnus of the prestigious Jawaharlal Nehru University in New Delhi. In the past decade, he was the Professor and Director of Sustainable Heritage Development programmes, Research School of Pacific and Asian Studies, at the Australian National University, Canberra and Australia’s first Professor of Museum Studies at the University of Queensland, Brisbane. Over the years, he has worked as the International Technical Adviser in South Africa and also at the National Museum of Ethnology, Leiden, on Museums and Cultural Diversity Promotion in the Netherlands. He is the Guest Curator of International Projects with the Vietnam National Department of Cultural Heritage, especially World Heritage Sites. He is also the Editor-in-Chief of three academic journals dealing with Sustainable Heritage Development: International Journal of the Inclusive Museum; International Journal on Intangible Heritage; International Journal on Environmental, Cultural, Economic and Social Sustainability. Katarina LINDHOLM (Finland) isProject Manager atDance Info Finland Dance Info Finland is charged with promoting the development of Finnish dance art and improving its status and operating conditions in society. In the course of this work it acts as a broad-based expert organisation whose activities include service and advisory work; reporting, publication and promotional activities; research, education and development projects; and advocacy. Laurie NEALE (Netherlands) has worked in the area of safeguarding Europe’s cultural heritage for the past 25 years. Trained as an architect at McGill University, she specialised in her Master’s Degree (Bartlett School of Architecture and Planning, UCL) on the study of the effects of our built environment on human behaviour and social interaction. During a decade at the secretariat of Europa Nostra, the Voice of Cultural Heritage in Europe, she was in turn responsible for managing the NGO’s Award scheme (the European Union Prize for Cultural Heritage/Europa Nostra Awards), communications and their Heritage in Danger programme. Now a member of Europa Nostra’s elected Council, she continues to advice on a number of its on-going ambitions and towards multiple stakeholders. Phloeun PRIM (Cambodia), CEO, Season of Cambodia, and Executive Director, Cambodian Living Arts, was born in Cambodia. He and his family immigrated to Canada when he was three years old. He returned to Cambodia in 1998 and joined a European Union program with 50 traditional Cambodian artisans. Phloeun helped to transform the program into a self-sustainable company called Artisans d’Angkor. Now employing over a 1,000 artisans and staff, Artisans d’Angkor distributes high-quality traditional handmade crafts throughout Cambodia and around the world. In 2010, pursuing his interest in social entrepreneurship, he was appointed as the first executive director of Cambodian Living Arts. His appointment followed five years serving on the Cambodian Living Arts Board. He is based in Phnom Penh. Yolanda SMITS (Netherlands/Belgium) of KEA is director of international business development with more than 20 years of experience in dealing with European affairs and international trade. She is specialised in copyright, trade and development issues affecting the cultural and creative industries. Ragnar SIIL (Estonia)has been Undersecretary for Fine Arts at the Ministry of Culture in Estonia since 2011. Since 2005, he has been working at the Estonian Ministry of Culture as a Minister’s Adviser, Development Adviser and since 2007 until 2011 as the Head of the Development Department responsible for strategic planning and creative industries policy and for the creative economy agenda at a state level. His main interests are in the field of arts and cultural policies, cultural and creative industries, international and national cultural policies, cultural management, cultural districts and regeneration. In 2005, Ragnar graduated in political science from University of Tartu, specializing on international relations and public administration. Ragnar is a member of European Commission’s working group on creative industries and a chairman of the European Union’s working group for cultural and creative industries and a member of the Steering Group of Northern Dimension Partnership. As part of ASEF Cultural Policy Dialogue Series in 2014, ASEF will organise the 7th ASEF Public Forum on Creative Industries in Asia and Europe: Enabling Crossovers on 18 October 2014 at the Pakhuis de Zwijger in Amsterdam, the Netherlands. The event is in partnership with the Ministry of Education, Culture and Science, the Netherlands and Het Nieuwe Instituut from the Netherlands and with the support of the European Cultural Foundation. The Public Forum is an official side event of the 6th ASEM Culture Ministers’ Meeting on 19-21 October 2014 in Rotterdam, the Netherlands which will focus on the benefits and challenges of the creative industries. The Public Forum will also mark the opening of the ASEM Cultural Network Programme from 18-21 October 2014 across the Netherlands, which will gather 40 creative professionals from Asia and Europe for four days of workshops and site visits. The Forum will focus on policy debates around the creative industries in Asia and Europe in the framework of economic growth, sustainable development, social inclusion and empowerment. This platform will explore possibilities for future collaborative projects between Asia and Europe, thereby contributing to greater bi-regional collaboration. Ambassador ZHANG Yan, ASEF Executive Director, will deliver his welcome remarks during the opening of the Public Forum on Saturday, 18 October at 4:30 pm. Among the speakers will be leading voices from Asia and Europe including: Mr Charles LANDRY, an international authority on the use of imagination and creativity in urban change and inventor of the concept of the Creative City; Mr Anmol VELLANI, Founder and Former Executive Director, India Foundation for the Arts and theatre director; and, Ms Ada WONG, Founder and Chief Executive of the Hong Kong Institute of Contemporary Culture and the Supervisor of the Lee Shau Kee School of Creativity, Hong Kong. ASEF’s publication, Enabling Crossovers: Good Practices in the Creative Industries was launched on 20 June 2014 at the 1st Senior Officials’ Meeting of the 6th Asia-Europe Meeting (ASEM) Culture Ministers’ Meeting in Rotterdam, the Netherlands. The first copy of the book was handed to Ms Marjan HAMMERSMA, Director General - Culture and Media, Ministry of Education, Culture & Science, the Netherlands by ASEF’s Deputy Executive Director, Karsten WARNECKE. The publication, which includes 36 good practices in policy and practice from 33 countries in Asia and Europe, serves as an inspiration for networking, collaboration and policy making, with particular focus on the upcoming Ministerial Meeting. It covers the 4 areas to be discussed at the Ministerial meeting, namely: creative skills, creative entrepreneurs, creative cities – sustainability, and creative cities - quality of life. Essays by eminent cultural thinkers and experts including Guus BEUMER, Charles LANDRY, Paul RUTTEN, Mary Ann SCHRUERS, Anmol VELLANI, and Ada WONG are also included. The publication was prepared in collaboration with the Ministry of Education, Culture and Science, the Netherlands and Het Nieuwe Instituut, Rotterdam in ASEF’s capacity as an official partner of the 6th Asia-Europe Meeting (ASEM) Culture Ministers’ Meeting.